We all love the loose-fitting, oversized, or chunky sweater look for fall. Whether it’s paired with jeans, a skirt, cropped trousers—or anything, really—the comfy staple lends itself perfectly to a cool and relaxed look that can carry throughout autumn and winter. The only problem is, for us petite girls at least, that they’re not always the most flattering. Why? Because if there’s anything my 5’2" stature has taught me, it’s that any top that covers your entire torso and-then-some can quickly make you look, well, short and thus is unflattering. In fact, a lifetime of disappointing attempts at looking cute in a sweater is what led me to discovering this hack. Since you can’t tuck most jumpers in (unless they’re ultra thin and tight), in order to make one look flattering, it the bottom needs to cinch at your waist and sort of fold over itself—a look that lends itself perfectly to being paired with on-trend high-waisted jeans, skirts, and dresses. How do you get it to do this? 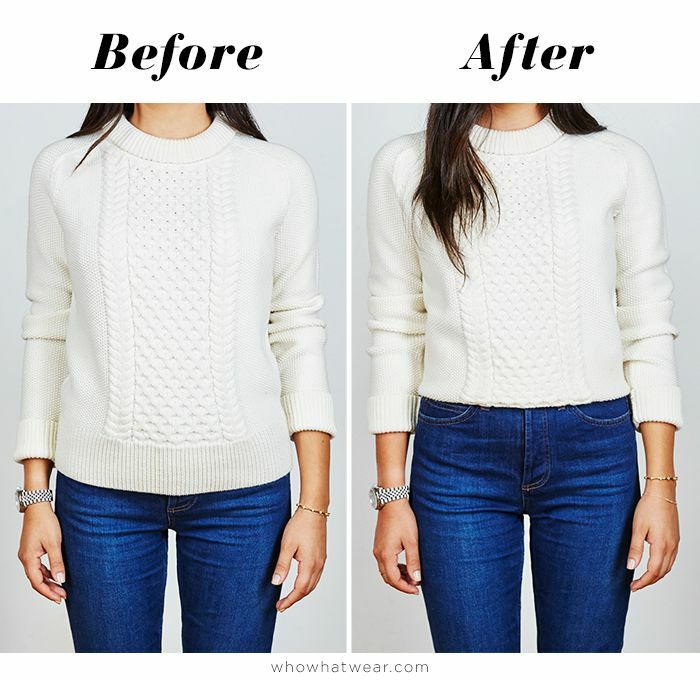 Since a relaxed sweater is naturally going to fit a little bigger, you have to cinch it with safety pins (or sew, if you’re handy with a needle and thread) on both sides so that it tightens and stays in place when you tuck it under. Scroll down to see what I mean plus, step-by-step instructions on how it’s done! Will you be trying our tip? Tell us in the comments!